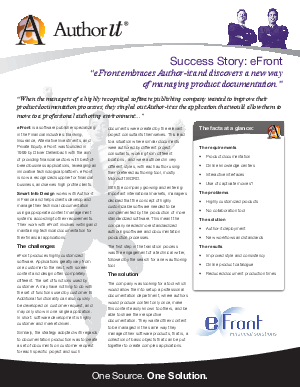 eFront produces highly customized software. Applications greatly vary from one customer to the next, with screen content and design often completely different, so software development is highly customer and market driven. The company was looking for a tool which would allow them to setup a professional documentation department, where authors would produce content only once, make this content easily known to others, and be able to share their respective documentation.